The Empty Stadium: Which seats in this stadium are Personal Seat License-free? Which seats in this stadium are Personal Seat License-free? If you guessed the green ones, you'd be right. For the following amounts, the Cowboys offered fans the opportunity to pay them upfront or finance the amount for 30 years. Also, these prices are per seat and do not include the cost of tickets (which, for the Cowboys, are roughly twice the league average) or parking. 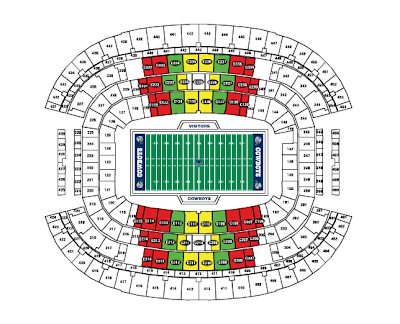 Of course, these seating plans do not include Cowboys Stadium luxury suites (which includes Field-Level suites that are closest to the action). Depending on the location, these suites cost between $100k-$500k annually, and contracts require a 20-year lease. Is a stadium such as this, praised by ESPN/NBC (the latter called it the "Taj Mahal" of sports and a "modern day marvel," while Bob Costas introduced it as "the palace in Dallas"), and the NFL, elitist in that it prices out the common man? What is troubling is not that there are different prices for different seats in stadiums - I understand that better seats have always cost more money than nosebleeds. Furthermore, I realize that colleges and universities have recently introduced donation programs where contributions to the athletic fund grant access to the best seats in their stadiums. What is troubling is that the Cowboys Stadium physically separates the haves from the have-nots and that it is being praised as an archetype - a model for future stadiums. Is this really a trend that the NFL should be applauding? 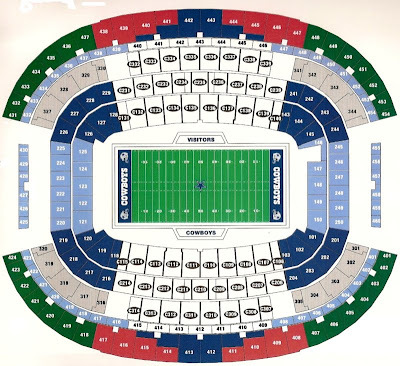 In the end, no matter how big of a Cowboys fan you are, if you aren't able to afford these prices, then your only option is to fight for those green nosebleed seats ($59 a ticket) or enjoy your time in the proletariat zone of the stadium, a standing-room only section of the stadium where "Party Passes" cost just $29. Party, indeed. Did I mention that the taxpaying citizens of Arlington are partially funding this Mahal? To the tune of $325 million? How 'bout them Cowboys!